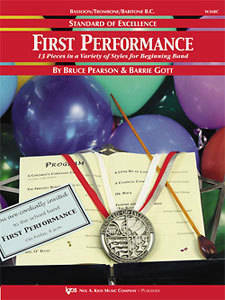 First Performance is a collection of 13 Very Easy/Easy (Grade - Grade 1) pieces for beginning band. The variety of styles including marches, folk songs Latin, rock, blues, transcriptions, and holiday music provide fun and exciting repertoire for beginning bands from the very first concert and throughout the year. Each selection is composed to ensure student success with extensive cross-cueing, limited ranges, and interesting parts for all sections. First Performance provides quality literature ideal for concerts, contests, and all first-year, programming needs!